In the second harsh critique by activist hedge fund investors in months, Forest City Realty Trust yesterday was portrayed not only as underperforming relative to real estate peers, but self-victimized by "a tangled web of nepotism and self-dealing," and with the Bruce Ratner-led New York subsidiary, Forest City Ratner, as contributing by far the worst performance. The Stamford-based hedge fund, Land and Buildings Investment Management, revealed that it had unsuccessfully pushed for Forest City to open up its board and otherwise take measures to boost the stock price. It said that last month's decisions to remove control by the extended Ratner family, thus collapsing the two-class stock structure and recasting the board to formally end family control, were insufficient. Land and Buildings publicly released its statement as a letter (also at bottom) to shareholders. The Cleveland Plain Dealer reported that Forest City did not comment as of yesterday afternoon. The Plain Dealer suggested that Land and Buildings owned about 1% of the company's stock. Note that the hedge fund with a reported 7.4% stake, Scopia Capital Management, is apparently content with the measures already taken after it pushed for the end of family control. "For the first time in my 25 years of following Forest City Realty Trust, I believe that the Company is now investable," wrote the Land and Buildings' founder, Jonathan Litt. But "[s]hareholders should not be fooled into thinking the reclassification into a single class of stock will by itself fix Forest City’s problems going forward." He argued that, despite Forest City’s "enviable" real estate, the firm is "substantially undervalued," with "at least 40% upside to a net asset value of $30-plus." Forest City's net operating income margins are well below that of peers. "G&A [general and administrative] expenses are bloated, in our view, because Forest City is poorly run, inefficiently structured and a dubious source of income for countless Ratners and other insiders," Litt wrote. 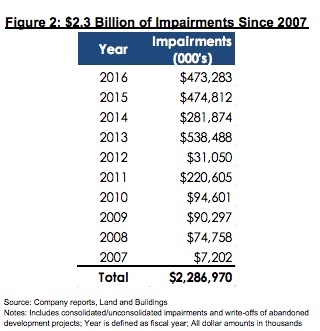 "Forest City shareholders have endured $2.3 billion of impairments over the past decade (Figure 2), which is equal to nearly 40% of the Company’s current equity market capitalization, as management, led by numerous Ratner family members, has repeatedly destroyed value through development. No one has been held accountable for the losses and the Company maintains over $800 million of construction in progress despite the abysmal track record. The "vast majority" of some $1.8 million in accounting losses--an impairment is "the difference between the property’s fair value and its carrying value"--over the past four years have come out of Forest City Ratner, in New York, Litt wrote. He cited $743 million in failed investments regarding Pacific Park Brooklyn and B2 (aka 461 Dean), as well as $399 million related to the Ridge Hill mall in Yonkers. Let me see if I can do the math: the B2 impairment was $146 million, while Atlantic Yards/Pacific Park impairments were $299.3 million and $242.4 million, all before taxes (which lowered the hit). That adds up to $687.7 million, not $743 million, which means either I'm missing something or the the hedge fund is overinclusive. Update: the November 2017 impairment of $44.3 million related to B2 brings the total to $732 million. "The investment in the Brooklyn Nets and the construction of the Barclays Center in Brooklyn was another billion-dollar distraction that did not benefit Class A holders of Forest City, in our view," Litt wrote. He didn't call it a loss. Obviously, Forest City believes (or believed) that the arena and team were needed to leverage what former Chairman Chuck Ratner called "a great piece of real estate." Little suggested that Forest City "should continue to lower leverage and scale back its external growth ambitions." Indeed, that's likely why Greenland Forest City Partners has sought new investors for three building sites in Pacific Park. "FCE/A’s total shareholder return has consistently underperformed peers by a significant margin over short, medium, and long-term time horizons as the Company suffered and continues to suffer from numerous operational, capital allocation and, in particular, corporate governance deficiencies," wrote Litt, calling recent "half-measures to modernize and improve... deeply insufficient." He said that it was "outrageous" for the Ratner family to get $120 million to give up their controlling shares. "To add insult to injury, in 2015, millions were paid to the ten members of the Ratner family that will likely remain on the payroll despite the family’s only ~12% ownership of the Company’s Class A shares (following the Class B share buyout)," he wrote. Note that I'm not sure what they mean by Ratner's "private entities"--surely not Forest City Ratner, but a personal holding company? Note that it's unclear, for example, whether Ratner is leasing luxury apartments at a significant discount. The letter also cited nepotism "beyond the Ratner Clan," with the brother of CEO David LaRue holding an executive position and the sister of CFO Bob O'Brien doing contract work for the company. Forest City also refused to add "up to an additional three new directors to the Board at the next annual meeting, as the two new directors will be outgunned by the eleven continuing Ratners/legacy Board members." Land and Building also accused Forest City of refusing "to permanently opt out of the Maryland Unsolicited Takeover Act (MUTA), so the Board cannot unilaterally decide to stagger the Board." As the Plain Dealer noted, that helps defend against hostile takeovers. So some of this is a very aggressive hedge fund that wants to leverage some profits. But some of the harsh charges may stick--in other words, why have there seemingly been no consequences for Forest City's underperformance? Does family ownership and control militate against that? From Business Insider: Pacific Park by 2025?